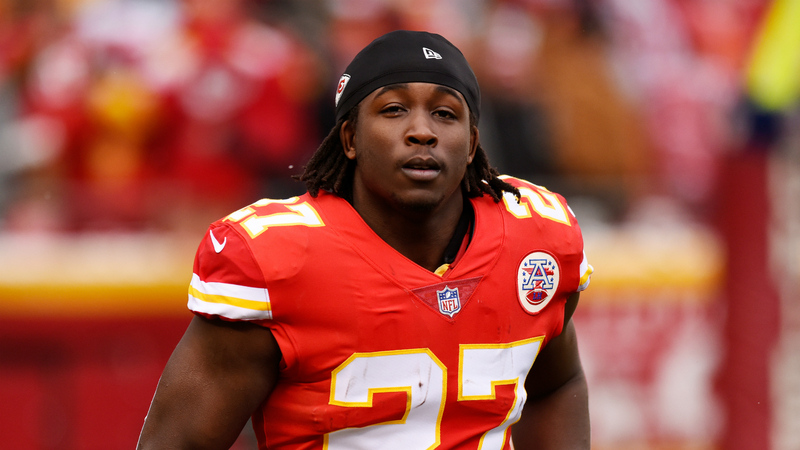 A video that appears to show former Chiefs running back Kareem Hunt shoving and kicking a woman at a hotel in February 2018 was released by TMZ on Friday. In footage captured by security cameras, Hunt can be seen from multiple angles trying to physically attack a woman, pushing through several men and other women attempting to restrain him. At one point, Hunt knocked one of the men into a woman, causing them both to fall over. Police responded to the altercation, which occurred inside a hotel in Cleveland, but no arrests were made and Hunt did not face criminal charges. The Feb. 10 incident was known to the NFL, Chiefs team personnel and the public based on earlier reporting. Hunt addressed reporters about the accusations and a separate assault allegation prior to the 2018 NFL season, but the video had not been made public until now. In the immediate aftermath of TMZ’s report, the Chiefs sent Hunt home from practice Friday, according to ESPN. What do we know so far about what happened with Kareem Hunt? The incident occurred Feb. 10 between Hunt and Abigail Ottinger, 19, inside The Metropolitan at the 9, a hotel in downtown Cleveland. Ottinger told police Hunt assaulted her about 3:45 a.m. outside a hotel apartment, according to Cleveland.com. Charges were not filed and no arrests were made “because officers say they were unable to determine if a crime had been committed,” according to TMZ. How have the Chiefs responded to the incident? The Chiefs claimed they did not see the video footage until Friday, according to The Athletic, but several members of the organization had previously commented on the incident, mostly in an attempt to move on from the situation. At the time, Clark Hunt did not believe Kareem Hunt would face a suspension from the NFL. Chiefs coach Andy Reid declined to comment on the specifics of the incident when asked about it in June. What is the NFL’s personal conduct policy? The NFL’s personal conduct policy explicitly grants the league freedom to punish players even if they are not found guilty of a crime. According to the policy, “Even if the conduct does not result in a criminal conviction, players found to have engaged in any of the following conduct will be subject to discipline.” It lists “actual or threatened violence against another person” and “disorderly conduct” among potential reasons for sanctions. The NFL stipulates a suspension of at least six games for first-time offenses involving assault, meaning the league could still act following the video’s release. Spencer Ware is expected start against the Raiders. This article has been updated with the NFL placing Kareem Hunt on the commissioner’s exempt list and the Chiefs releasing Hunt.